From the first collection of New York design duo Roman and Williams, the Bachelor Bar Cart is an impressive way to serve your drinks — married or not. Each one is made to order using Claro Walnut with dark brass hardware and capped with a silver mirrored top. The handsome piece fits well into any living space, with a tapered leg frame at the base along with a set of wheels to ensure your next drink is always within reach. Width: 29.25" / Height: 27" / Depth: 17.5"
Each Bar Cart is Made to Order. Please allow 8 to 12 Weeks for Delivery. Produced in the 1950s, Arne Vodder's Chaise Lounge showcases his timeless designs. The vintage piece mixes a natural teak frame and a curvy silhouette — a signature of the Danish designer. It's finished off with a weaved leather seat and wooden tray table for a nightly brandy. Aside from a single strap, the entire chair is completely original making this one rare find. Born from the concept of a vehicle emerging from liquid metal, the Discommon Coffee Table creates the same effect from a four foot long, four-inch thick block of 6061 aerospace-grade aluminum. As it takes 100 hours of designer time to create each unique vehicle model and finalize textures and finishes, the run is being limited to just 10 tables. 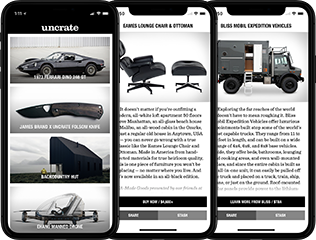 When you order, you get to pick the vehicle your table will feature, and will also be involved picking surface finishes, approving the design, and picking the hard anodized color of the final product. Four tables have already been produced, including the Ferrari F40 example seen above. Inspired by a spinning coin, the Dime Bar Cabinet is a delightful place to store your favorite spirits. Its exterior is made from curved segments of American walnut that fold back to reveal the bar inside. A countertop offers plenty of workspace while a shelf above and slots below give you a multitude of storage. Designed in 1949 for the Eames' Pacific Palisades home — also known as Case Study House No. 8 — the Eames Coffee Table is a perfect complement to a mid-century setup. Replacing the gold-leaf top of the original is a solid piece of Carrara marble, white ash veneer, or walnut veneer, paired with a matching turned wood dowel and powder-coated steel wire base similar to the one found on the iconic Shell Chair. Manufactured by Herman Miller in the USA, it's available in rectangular and square varieties.